Large solar flare may trigger the Dellinger phenomenon. If it occurs, it may cause the shortwave communication failure or trouble of the radio broadcast. The risk depends on the level of following items. Radio waves at medium frequency (MF, 300 kHz – 3 MHz) and high frequency (HF, 3 – 30 MHz) are reflected at the ionosphere, and they have been used as a over-the-horizon communication method for a long time. Today, MF and HF are used in aviation communication, marine radio communication, broadcasting, and so forth. Such radio communications are affected by ionospheric disturbances. Immediately after the occurrence of a solar flare, strong X-rays from the sun cause abnormal ionization in the ionospheric D region in the dayside hemisphere. In this condition, radio waves at MHz frequency or lower are absorbed in the D region, resulting in communication failure. After intense solar flares, similar communication problems occur in the polar D region owing to high-energy solar protons from the sun. During a negative ionospheric storm, in the frequency range of MHz to 10 MHz will not be reflected at the ionosphere, therefore it cannot be used for long-distance communications. Furthermore, when the sporadic- E (Es) layer develops, radio waves at 10 MHz order, which normally penetrate the ionosphere, will be reflected at the Es layer, and propagate anomalously beyond the line of sight. This condition affect the long distance radio broadcasting and the wireless emergency alerts. Radio waves at higher frequency which generally penetrate the ionosphere are also affected. In the irregular conditions of ionosphere such as the plasma bubbles, which generated in the equatorial region and sometimes extend to the mid latitude region, cause fluctuations in the strength and phase of the GHz-band radio waves used for communication/broadcasting satellites, remote sensing satellites, global navigation satellites, and so forth. This phenomenon is called ionospheric scintillation, and causes the loss of lock on satellite signals in the worst case. Disturbances in space weather can affect the aircraft’s communication with ground control, positioning errors, and passenger exposure. If any level of following items increases, the aircraft's route may be changed depending on the decision of each airline. On the aviation operation, the space weather affects following three categories: “satellite positioning”, “radio communication”, and “crew exposure”. In recent years, the satellite positioning has been used on aviation operation. The ionospheric variations cause the positioning error of the aircrafts (refer to the "Satellite Positioning" section). The 2nd impact is on the radio communication. The VHF band is used for short distance communications, and the HF-band is for over-the-horizon communications. 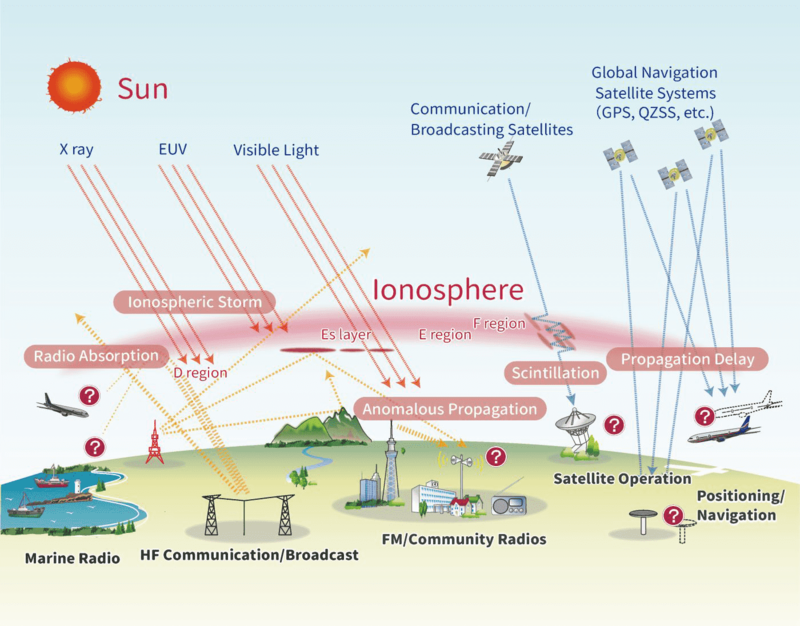 When the ionospheric storm occurs, or immediately after the solar flare, HF-band radio communication becomes unusable (refer to the "Radio Communication/Propagation" section). In particular, in the polar regions where it is difficult to use satellite communication, aircrafts might reroute to prevent the loss of all communication methods when the intence solar flare occurs. The 3rd inpact is the crew exposure. If the number of solar high-energy particles increases, the risk of radiation exposure level on the aircraft crew will increase. The target value on the exposure dose of the aircraft crew is regulated up to 5 mSv per year (refer to “Guideline on Management of Cosmic Radiation Exposure for Aircraft Crew”, Ministry of Education, Culture, Sports, Science and Technology, 2006). During the intence solar flare, the radiation exposure of aircraft crew is estimated as almost 4 mSv, which is close to the annual maximum value (refer to “Investigation into Cosmic Ray Exposure to Aircraft Crew”, Ministry of Education, Culture, Sports, Science and Technology, 2005). By the effects of Solar Energetic Particles (SEPs) and magnetosphere plasma particles, the risk of the malfunction should be concerned when any level of following items increases. Satellites are launched for various purposes, and are utilised in our lives, for example, communications, broadcasting, earth observation, and space observation. Satellites are greatly affected by fluctuations in the space environment because they are operated in the environment of charged particles, extremely dilute air density, electrons and ions are in the plasma state. The effects of high-energy particles, such as proton phenomena (SEP * 1) and galactic cosmic rays, might cause malfunctions of satellite-based computers and memorys. The satellites might be damaged by the electric-current fluctuations in the magnetosphere and Ionosphere which cause the geomagnetic disturbances, and particle variations in the magnetosphere. The auroral substorm which is also a source of geomagnetic disturbances, causes plasma injection into magnetosphere from the magnetotail, and it changes the space environment of geostationary satellites and low orbital satellites by charging and discharging the sattelite serface. Furthermore, the polar ionospheric current variation which associated with auroral activity causes heating of the upper atmosphere, and increases the atmospheric density. This might change the orbit of low orbital satellites. If the large geomagnetic disturbance is predicted, these satellite risks need to be alerted. The geostationary orbit is located at the outer radiation belt. High-energy electrons are greatly vary depending on the effects of the solar wind and the condition of magnetosphere. High-energy electrons above 500 keV penetrate through the satellite structure and cause internal charging of semiconductors and cables. If these accumulated charge are discharged, it might cause the malfunction or failure of the satellite. The positioning accuracy calculated from the delayed arrival time of radio wave can be affected by the disturbance of Ionosphere. The risk of the error should be concerned when any level of following items increases. Ionospheric plasma has the property of delaying the propagation of radio waves passing through it. In the positioning/navigation with Global Navigation Satellite System (GNSS), such as GPS*1, the position of the GNSS receiver is calculated by receiving radio waves from several GNSS satellites and measuring the distance between each satellite and the receiver. But the delay of radio waves in the ionosphere cause errors of measuring satellite-to-receiver distance, and it degrade the precision of GNSS positioning/navigation. For example, if the GPS positioning uses only one frequency, the error in position determination is sometimes over 10 m depending on the ionospheric variations. This is the maximum error factor of GPS positioning. The ionospheric delay is determined by the frequency of radio waves and the total number of electrons along the satellite-receiver path (see Figure 2). 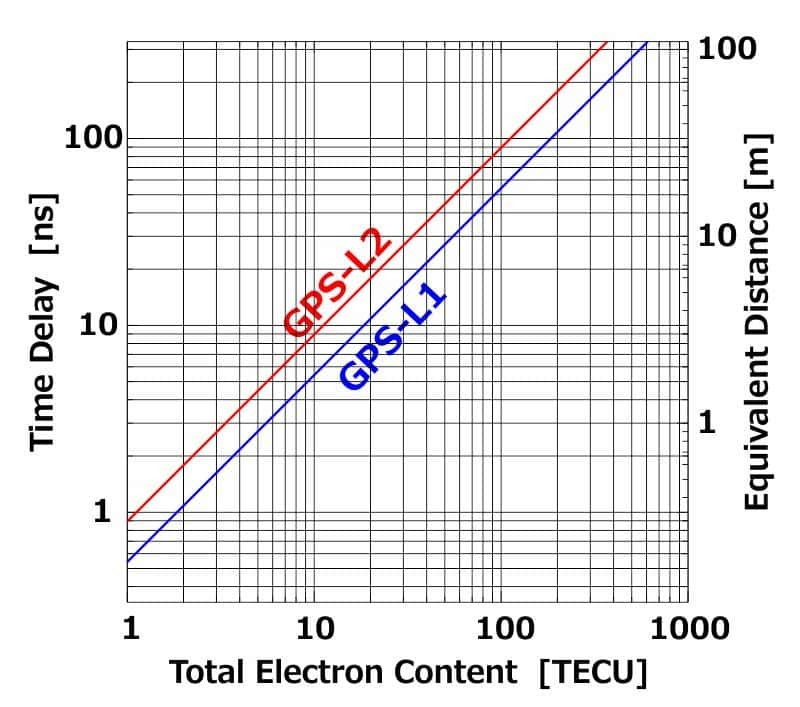 The total number of electrons is called the Total Electron Content (TEC) and is generally expressed with the TEC unit (TECU, 1 TECU = 1016/m2). The L1-band radio waves used for GPS positioning suffer the delay of 16 cm per 1 TECU. The TEC in the ionosphere greatly changes depending on the season, the local time, the solar activity, and so forth. In the mid-latitudes such as Japan, TEC is on the order of 10 TECU in the daytime and 1 TECU in the nighttime. It causes a delay of several meters in the L1-band, and it affects the accuracy of the GPS positioning. To resolve the ionospheric delay, one of the solutions is to use the ionospheric correction informations which acquired by ionospheric observations with multiple ground-based GNSS receivers. However, the ionosphere varies day by day, and there are various temporal/spatial phenomena. Especially, if the ionospheric phenomena with TEC's large temporal and/or spatial variations occur, it would be difficult to produce precise ionospheric correction information. Furthermore, ionospheric scintillation due to the ionospheric irregularity with the plasma bublle affects the strength and phase of the GNSS radio waves. It causes the loss of lock on GNSS signals in the worst case (refer to the “Radio Communication/Propagation” section). If the Solar Energetic Particles (SEPs) increase, astronauts may be exposed to radiation. If any level of following items increases, extra vehicular activity might be suspended to prevent crew exposure. Solar energetic particles can affect the human space activities. On the International Space Station (ISS), and on the surface of the moon and Mars, The solar energetic particles may cause fatal accidents in the worst case. In the ISS operation, the intensity of the radiation exposure dose is predicted; the effective dose is normally equivalent to 0.5 mSv per day inside the ISS, while it rapidly increases by at least an order of magnitude during a few days of solar particle events. Outside the ISS, the exposure dose also increases several fold, resulting in a relative increase in the exposure dose on the skin and organs near the body surface. Exposure dose of 0.5 mSV is equivalent to 10 times that of X-ray photography. The dose reference value on the bone marrow of astronauts is set to below 500 mSv owing to their special missions. NASA of the US has a system for monitoring space weather continuously. When an alarm is issued by the International Space Environment Service (ISES), it is immediately transmitted to the corresponding staff of NASA, who determine whether human space activities should be cancelled. Furthermore, in the near future, it is imagined that, when an alarm is issued, people on the moon or Mars can escape into a shelter, or tourists in space may promptly return to Earth. A large magnetic field disturbance causes an induced current. It may affect a failure in the electrical transmission facility. It may result in a blackout of the power supply. If the amplitude of geomagnetic disturbance is very high, the trouble should be seriously concerned. Geomagnetic disturbances by geomagnetic storms and auroral storms affect the electric power grid. When the geomagnetic field is greatly changed, the Geomagnetically Induced Current (GIC * 1) causes overheating of the transformers in power plants and malfunction of the protective relays. In North America and Northern Europe, where magnetic latitude is high, have been experienced the power plants failure caused by GIC. For example, on March 13, 1989, a major geomagnetic disturbance occurred in Quebec, Canada, resulting in a blackout on approximately 6,000,000 people for over 9 hours. On October 30, 2003, about 50,000 people were affected by power outages in Malmo, Southern Sweden, due to a power grid failure. As Japan is located in the relatively low geomagnetic latitude, the problem caused by GIC has not been reported. However, if we experience a intence geomagnetic storm which has never been seen before, the power grid in Japan, especially in the high latitudes such as Hokkaido and the other regions would be affected by GIC. On the other hand, the geomagnetic variation associated with the space weather can be utilised. In the field of magnetic exploration especially for underground structure, the electromagnetic waves from natural phenomena is used as a signal. Through measuring and analyzing the geomagnetic and the earth current associated with space weather, we can explore geothermal and natural resources in wide and deep range. When the geomagnetic variation is active, it is more convenient for magnetic exploration because the stronger signals make a better quality data. Aurora becomes active when the space environment is stormy. If the amplitude of geomagnetic disturbance is very high, you may see red aurora even in Japan. Aurora is a discharge phenomenon at over 100 km hight. 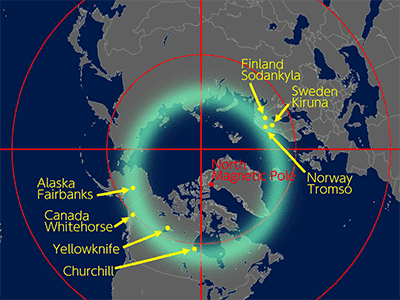 It is observed in circular area around the Arctic and Antarctica, which called the auroral belt (see Figure 3). Aurora is closely related to the polar geomagnetic disturbances. When the geomagnetism is disrupted, the auroral activity is active. Geomagnetic disturbances are caused by plasma clouds (CME * 2) which emitted from the sun to the Earth, and by the high-speed solar wind from a coronal hole. Due to CMEs occur suddenly, it is difficult to predict that when the geomagnetic field will be disrupted. If the high-speed solar wind from a coronal hole is maintained for a certain period of time, the geomagnetic disturbances might occur again in 27 days later by the rotation of the sun.